Tasty Tours' Farmer's Market Sweets Tour + 15% Promo Code! Like chocolate? Love sweets? If your answer is "YES!" 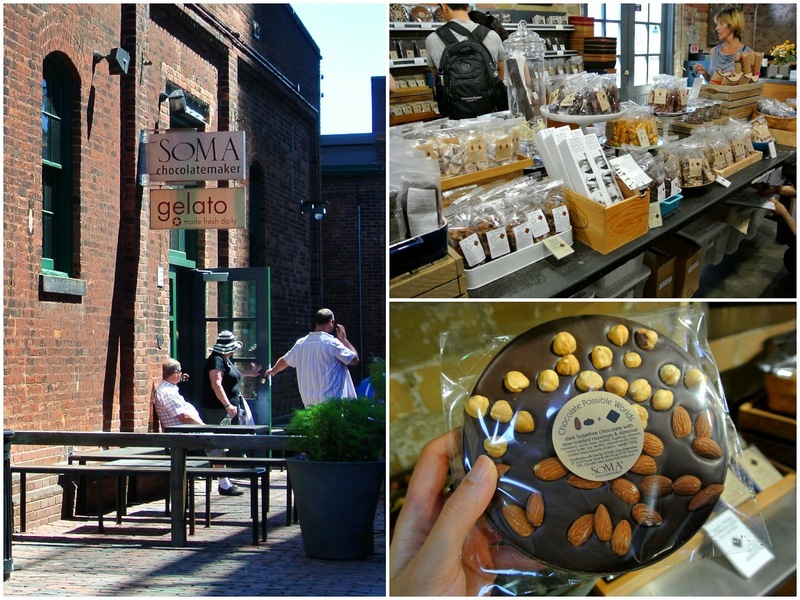 then Tasty Tours' new Farmer's Market Sweets Tour at the Distillery District is not to be missed! Tasty Tours offers fantastic sweets & chocolate walking tours in the city (i.e. take a look when I joined their special Canada Day Sweets tour). With the Kensington Sweets Tour and the Trinity Bellwoods Chocolate Tour already in its portfolio, Tasty Tours (Twitter: @tasty_tours, Facebook: Tasty Tours Toronto) has upped its game this summer with the addition of their newest tour: the Farmer's Market Sweets Tour. The Distillery Sunday Market at the Distillery District (left), Audrey Ooi, founder of Tasty Tours (right). Working with the Distillery District Sunday Market, Tasty Tours' Farmer's Market Sweets Tour is Toronto's only farmer's market tour, and the only tour in Canada dedicated exclusively on Canadian and local sweets. I've managed to condense this 2.5 hour tour into one blog post highlighting the unique stops and treats I enjoyed the most. By the way, I couldn't have asked for a better day for a walking tour; the sun was out and not a cloud in the sky. Just gorgeous! 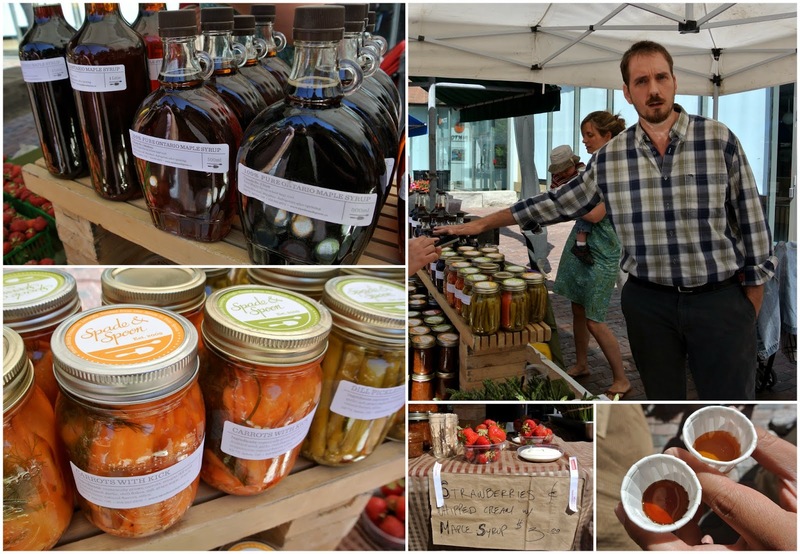 The tour began at the Distillery District Sunday Market where we sampled some local, fresh, and unique products. Couple Adam and Blyth brings the latest products of their farming, market, and preserving adventures straight from their Ontario family farm to our table. Expect to find endless jars of irresistible, original and organic preserves. Here we sampled some lovely dark, medium and light grades maple syrup. In the fall of 2007 the owners of Haute Goat left the city to find their own little piece of heaven just outside of Campbellford, Ontario – a big, rambley old farmhouse on 25 rolling, wooded acres and a herd of Nigerian Dwarf Goats. These goats give milk with the richest butterfat content of all of the goat breeds. 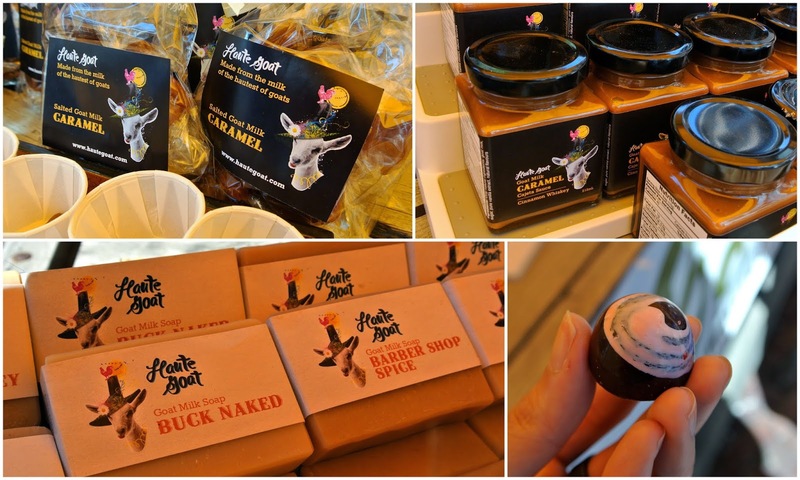 Hand-made chocolates, caramel sauces, caramel corn, milk soaps and body lotions all made from goat’s milk. We had some goat cheese chocolate truffles to try (bottom right). Note: Hi Honey is usually on the tour but we missed them that day. Hi Honey is a purveyor of pure and local Ontario honey, handmade honey soap, and pure Ontario beeswax candles. They also consult on urban beekeeping and installation of hives, and connects students to resources and education about bees and beekeeping. After our tour of the Distillery District Sunday Market we made our way to The Sweet Escape Patisserie on 25 Tankhouse Lane. The Sweet Escape Patisserie opened in May 2008 with the mandate to put a unique and whimsical spin on classic pastry and desserts (they make more than 30 kinds of sweet and savoury shortbread!) 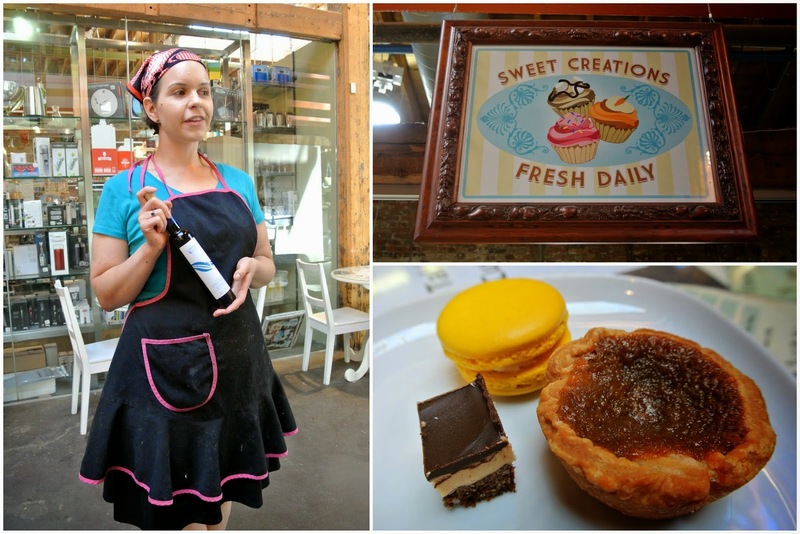 Chef / owner Michelle made us some exclusive, tasty Canadian sweets that day: ice wine macaron, butter tart and Nanaimo bar. Aside from sweets, The Sweet Escape Patisserie also features a wide range of sandwiches made on fresh baked bread and grilled to order, along with a selection of soup, salads and quiches (vegetarian, vegan and gluten free options also available). Next, we headed to Soma, one of the few chocolate makers in North America making chocolate in small batches directly from the cocoa bean. 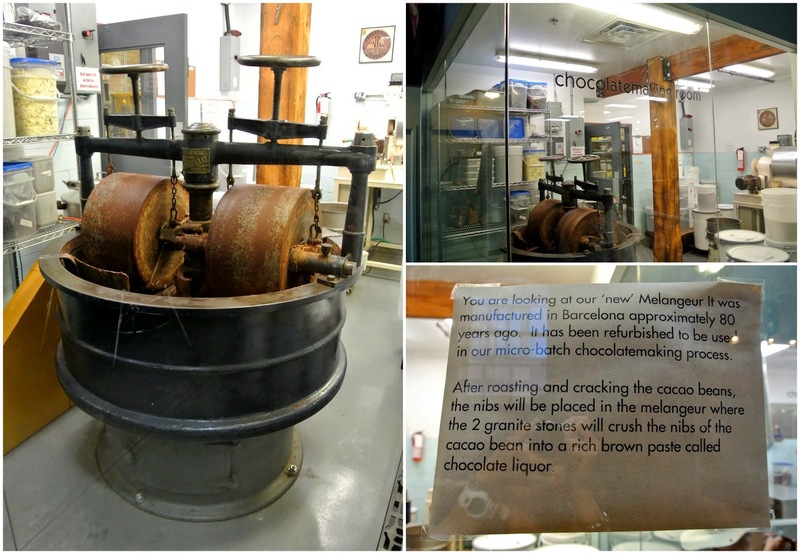 We had a brief look at Soma's chocolate making room as well as their melangeur (melangeur is a vintage chocolate grinding machine.) Soma's melangeur was manufactured in Barcelona approximately 80 years ago and was refurbished to be used in their micro-batch chocolate making process. We snacked on some Soma Cocoa Late during our tour there. With all that sugar in our system it was nice to end the tour with a Short Rib Poutine at Mill St. Brew Pub. Topped with Quebec cheese curds, Mill St. Brew Pub updated this Canadian classic dish with the addition of...you guessed it... booze! (Specifically with their Tankhouse Ale). Beer and poutine. Ahhhhhh...best combo! After poutine and beer we had a special guided tour of Mill St. Brew Pub's on-site brewery (this is not usually included in the Farmer's Market Sweets Tour). The brewery produces more than 12 handcrafted beers and ales, including the Original Organic Lager, Tankhouse Ale, Stock Ale and Balzac's Coffee Porter. We had the opportunity to see, sniff and even taste the different types of barley malt used in the production of Mill Street's organic beer. Visit the Mill St Brew Pub website to find more information on their brewery tours. 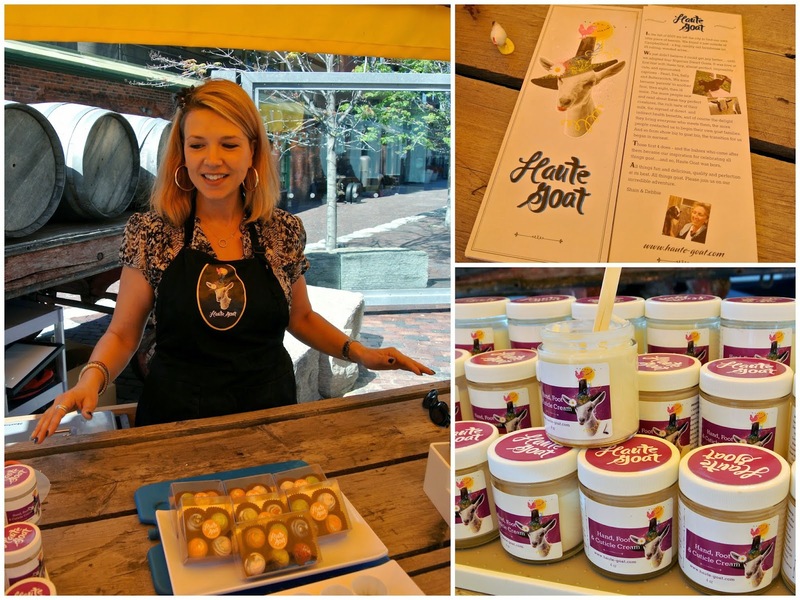 I really enjoyed Tasty Tours' Farmer's Market Sweets Tour. It was relaxing, fun and very educational. 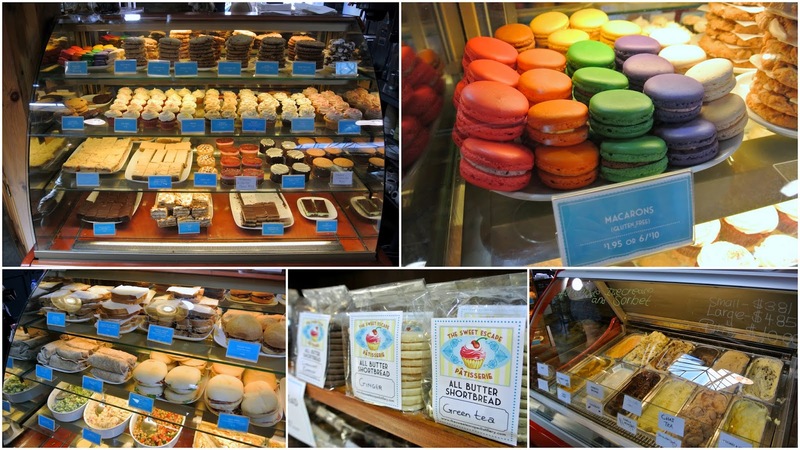 Filled with delicious treats along the way as well as discounts at select merchants, this tour is an excellent way to start any Sunday for tourists and locals alike. Food Junkie Chronicles has teamed up with Tasty Tours in offering 15% off ANY ADULT-PRICED TOUR from Tasty Tours! All you have to do is enter promo code "foodjunkiechronicles" when you book online (this promotion cannot be combined with any other offers).